Facebook – the social network that started in a Harvard dorm room 15 years ago – has evolved into a media and advertising giant. It's helped create a new age of precise consumer insights. With over 2 billion users worldwide, Facebook can offer granular data about each and every one of them to advertisers – not just demographics but the very narrowly defined interests, conversations and interactions they have on the platform. Advertisers try to leverage all that information into online purchases by directly targeting consumers with messages meant to stand out as they scroll through a newsfeed. As a media and advertising psychology scholar, I've been researching Facebook and its effects on persuasion for the past 12 years. Long gone are the days of brands offering consumers meticulously crafted messages with mass appeal that provide strong arguments or important cues to get them to change their attitudes and behaviors. My collaborative research suggests that people's motivations for using Facebook have shifted over the years. People used to visit for online socialization and interpersonal communication. But now their reasons are more passive, having to do with the desire to be entertained and the simple fact that checking Facebook is convenient. Second, users' perceptions of Facebook have changed. The size of a typical "friends" network has increased immensely. For many, the Facebook experience has shifted from simulating a high school reunion with a few handfuls of invitees to an outdoor rock concert with a huge audience. The connection with one's strong ties – your close friends – still remains. But people are gravitating toward using Facebook to see what's out there, grab a smile or a laugh and then move on with their lives. Sure, there's always the political rants, that obscene post by a college friend or other messages that make your eyes roll – but for the most part, people use Facebook because it entertains them and it's part of their daily ritual. Research suggests this pattern holds in the United States and other countries, such as Taiwan. 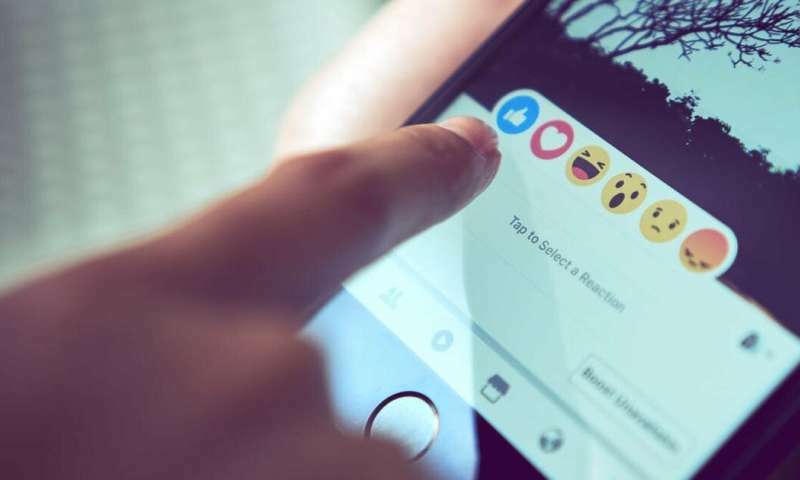 We were trying to understand the psychophysiological responses that precede specific behaviors on Facebook, such as pressing the "like" button as well as sharing or commenting on someone else's post. These behaviors have emerged over the years as indicators of online advertising and marketing effectiveness. Traditional advertising concepts like return on investment have been replaced by return on engagement. We found that prior to pressing the "like" button, participants exhibited a particular pattern of heart rate activation and skin conductance level – the same one that characterizes an orienting response. This is a brief, automatic "What is it?" reaction to an external stimulus or a change in the environment. It's the same response you have, without much conscious effort, when someone enters the room or calls your name. It makes perfect sense that pressing "like" would have similar characteristics. Who, when scrolling through an endless newsfeed, pauses to think long and hard about whether to "like"? Very few! The fact that people press the "like" button in this automatic mode is significant for multiple reasons. First, the nature of the Facebook environment offers multiple bits of information at any particular moment, all competing for your attention. Specific bits that do catch your attention may be lucky enough to be rewarded with a behavior – a "like" or a "share." And from an advertising perspective, these automatic behaviors are important. Other studies my colleagues and I conducted found that expressing intentions to like, share and comment on something were strong positive predictors of participants' readiness to enact relevant behaviors offline. It makes sense: if you "like" a bunch of woolen socks online, maybe you're getting closer to investing in some new warm gear. With tons of information presented at the same time, your brain is forced to decide quickly what's relevant or interesting. Facebook and other social media services take advantage of this – pushing you to slip easily from thought to behavior. It emphasizes your impulses and decreases the opportunities for you to think more thoroughly about your perceptions, attitudes and decisions. Think about seeing a product on Facebook, "liking" or "sharing" it, then immediately clicking the ad to place the product in a shopping cart on Amazon. Just like that, within a few seconds, you've moved from noticing a product and indicating an attitude online to that same product being purchased and marked for shipping to your doorstep. But having the infrastructure to facilitate these types of impulsive behaviors has ramifications for other areas of persuasion. Take alcohol use and overuse as an example. How does this thought-behavior connection pan out when someone with a high risk of alcohol abuse sees a message from a friend or a marketer on Friday night promoting drinking? Or when a college student sees his friends posing with green beer mugs on St. Patrick's Day on Facebook? Would that prompt him to get that nth drink that would raise his blood alcohol concentration level to a risky one? Our research on the effects of branded alcohol posts suggests this is plausible. Changing consumer habits combined with companies' abilities to target them with personalized messages streamed to their mobile devices mean advertisers and marketers are in a new environment. People mindlessly scroll, clicking automatically. Messages come at people nonstop, trying to convert them into consumers by exploiting those habits. And even at times when that conversion likelihood is low, brands can just try again, and again, and again and again.